As he and his allies step up their political challenge against others within Iran’s regime, President Rouhani has said that his Government — and its July 14 nuclear deal with the 5+1 Powers — will ensure economic recovery. 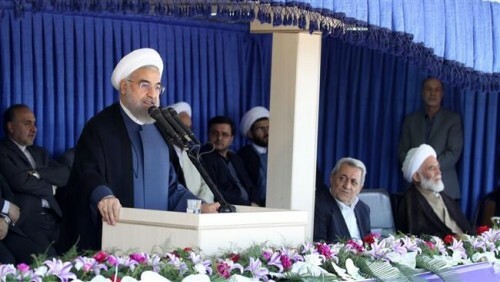 The President emphasized that the 5_1 Powers had recognized Iran’s right to uranium enrichment and “all the powerful countries are bound to support Iran in achieving better technology in the nuclear field”. The sanctions will be removed one after another. Our people will enjoy all of their economic and business rights and, god willing, we will witness rapid, sustainable growth and development in future months and years. The President said that the Government had kept the promise to reduce Iran’s inflation, which was at more than 40% when he took office in August 2013. He asserted that the rate was now below 14% and would fall farther. Rouhani and his allies have faced hardline criticism over the terms of the nuclear deal, with some MPs and clerics demanding a Parliamentary vote, but the Government appears likely to meet that challenge. So the political fight has moved towards important elections for the Parliament and Assembly of Experts in February 2016. Concerned about loss of economic holdings as well as influence, the Revolutionary Guards have attacked the Government’s foreign policy, using the Supreme Leader’s warning against any cooperation with the US. Rouhani and former President Hashemi Rafsanjani have not only pushed back, but are trying to seize the political offensive. The President has called for the powers of the Guardian Council over elections, including the vetting of candidates, to be curbed. Rafsanjani sought the support of senior clerics last weekend, with implicit criticism of elements within the regime and a call for the “people’s will” to be paramount. The President’s senior advisor, Mohammad-Baqer Nobakht supported Rouhani’s economic message with the projection that Iran’s economic growth will be 3% in 2015 and 5% in 2016. Iran’s GDP contracted 4.6% in 2013 before recovering in the second half of 2014 to expand by about 3%. The imprisonment of student activist Bahareh Hedayat, who has been detained since December 2009, has been extended by two years. Hedayat was expected to be freed after serving most of a 9 1/2-year sentence. However, she was summoned to Evin Prison on Tuesday and told she would now have to remain because of a two-year suspended term, imposed in 2006 after a student protest. A leader of the student organization Daftar-e Tahkim Vahdat, Hedayat was detained amid the protests after the disputed Presidential election of 2009. Her “crime” was to deliver videotaped addresses to audiences in Europe. She was convicted of “acting against national security and publishing falsehood”, “insulting the Supreme Leader”, and “insulting the President”. The Supreme Leader has continued his hostile rhetoric towards the US following the July 14 nuclear deal, using a photo opportunity with the Cabinet to make his latest statement. The Supreme Leader’s statement may have been a pointed reminder to President Rouhani, who has pressed his foreign policy of “engagement”, featuring meetings with the British Foreign Secretary — who reopened the UK Embassy in Tehran — this week. All political, economic, and cultural authorities must be vigilant not to play into the hands of the enemy under any circumstances and so that their decisions do not willingly or unwillingly help implement the package envisaged by the enemies. We neglect, and we suddenly find the enemy having infiltrated in certain areas and being engaged in dangerous cultural, economic, and political activities; therefore, we must be completely careful. Since Revolution, Zionists and Americans’ enmity toward the Islamic Revolution has not declined and our officials must not forget this fact. The Supreme Leader warned last week that the US would use the nuclear deal to encourage “sedition” within Iran as well as challenging Tehran in the Middle East.